oh, sweet joy! : save the date(s)! less than two weeks ((and i'm SO counting)) until the big blogiversary giveaway party! read about it here & see the handmade shops who are giving away some goodies here! i'm so excited and i don't even get to win anything! -if you are giving something away, you are more than welcome to enter all the OTHER giveaways. -you MUST MUST be a follower of this blog in order to participate. no exceptions. however, it's not too late to join the party! just click "follow" over there on the left. -you can enter all of them, or as many as you want! -it's going to be so fun! Oh sweet goodness, that is amazing, Kim. How nice are you! 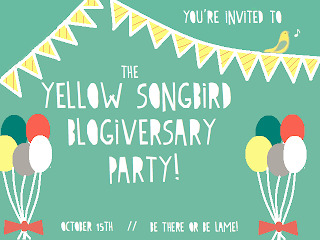 What a wonderful way to celebrate your blogiversary! It seems like I found you at the perfect moment! i just became a follower of your blog and i've never followed anyone before! woo hoo! this is SUCH a good idea! i love it. saving the date! xo. This sounds like fun...I follow you so you know I will be back to enter! Thank you for entering my weeklong giveaway event. Your blog is lovely...love love love your name! how fun is that going to be! yayy! !